Big Data and Data Science are multi-faceted concepts. In all of their guises, they are driving revolutionary changes in nearly all social, public, and institutional settings. One of most significant and far-reaching developments is the democratization of Data Science. Now everyone and every organization is "doing it". 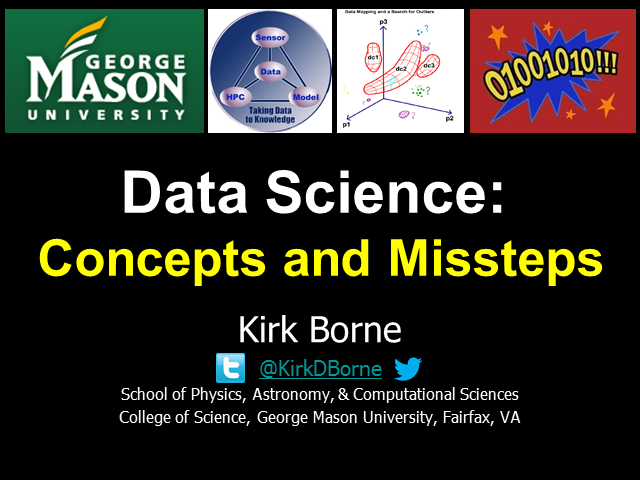 In this presentation, I will describe some of the most prevalent characteristics and concepts surrounding the current activities associated with Data Science. I will then describe the importance of Data Science as a research discipline and as an application methodology for making advances in Big Data Analytics. Following the discussion of these concepts (steps toward making discoveries from Big Data), I will then describe some of the misconceptions (missteps on the road to discovery) that can afflict current Big Data efforts.